The Holidays are a delight to the senses. Dark dreary weather is compensated with tiny twinkle lights that sparkle and dance in the night. The smells of baked goodies linger in the kitchen as a distant glow of amber candlelight flickers through streamed-moist widows. This season the gift of independence is within reach for some and threatened for others. The good news is statically speaking; only around 5% of the population over the age of 65 will spend this holiday season in a nursing home or care facility. As a nursing student I worked many Christmas Holidays, and try as we might recreate the intimacy of home, it always fell short. And perhaps for some, it was better than being alone. But, having experienced many holidays in healthcare settings, I always left at the end of my shift feeling sad for the residents. Preserving holiday traditions is yet another emotionally compelling reason to make continued aging in place for loved ones possible (and it is not always possible). Care facilities are designed for efficiency, they have to be—and this is the death of personal ritual. Taking care of groups of people under the same roof requires daily standardization of meal times, hygiene, and recreation; including holidays. Holiday-meaning making is created through personal rhythms and rituals; which must be unpacked on their own sweet time—they often cannot be rushed or sacrificed on the altar of Talyorism. The festive season is a time when families are gathered together to get caught up on each other’s lives and to share stores that renew bonds. Exchanging gifts has come to dominate the meaning of this season—so why not embrace it, and have it serve the greater good. Baby boomers looking to give a gift to a parent who “needs or wants nothing,” has purposeful options and the perfect excuse to give a universal design gift (a Trojan horse). Having the talk with an elder parent is never easy and the timing has to be right; around the Christmas tree is a sure way to dampen the spirit (not the best time). But you’ve got the perfect cover tis the season to give; so give them an aging-in-place gift to get started towards additional future home modifications. A really useful place to start is with a lovely grab bar for example or stocking stuffers like LED night lights. These thoughtful gifts can be easily worked into the conversation without focusing on infirmity or control issues. A Christmas gift given in the spirit of the moment is well received and likely to be embraced. The kids can get involved as well, by making gift certificates for services like CHANGE OUT 5 dull light bulbs for brighter ones (keeping granddad off ladders); or helping set the grandparents up with aging-in-place technologies like Telikin Computers, so they can keep in touch with SKYPE. 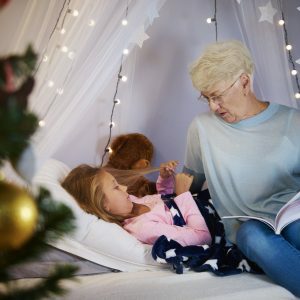 The message is that this season can be an ideal time to give a parent something they really want—independence; without the often associated conflict which surrounds behavioral change. Aging in place home modifications are put off primarily because of a lack of perceived susceptibility to the problem or for financial reasons. As a baby boomer you experienced many magical seasons in your parent’s home; all the smells, the textures, the visual delights, they’re still there and hopefully will be for more holidays to come. You can start the ongoing process of making “home” accessible for them now…increasing the odds they will be home by choice next year and beyond.